The stock factory air box is ugly and restrictive. Thinking of scraping the stock box and just adding a K&N conical filter to take its place? THINK AGAIN! Using an open element inside the engine bay is a proven waste of time. The under hood temperatures combined with fan wash (turbulence of the air caused by the fan cooling the radiator) will in most cases cause you to loose power. Here's an easy way to clean up your engine bay and get rid of that ugly, restrictive factory air box. 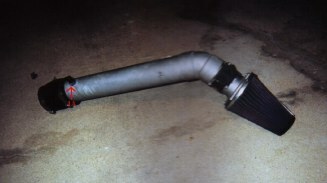 This tech article explains how I built my cold air intake but feel free to make any changes you like. I did use the K&N factory replacement filter for the stock air box with some modifications. You can refer to the tech article for here, ( http://www.sn95.com/projects/coldair.htm ), which I based my cold air intake on. They used a universal conical filter. First, an overview. This intake will completely remove the stock filter housing and mount the filter inside the fender. You will be using approx. 18-20" of 3" PVC pipe along with one (1) 45* elbow and PVC cement, four (4) 1/2" self-tapping sheet metal screws (if using your stock replacement K&N filter), a 3" thick rubber coupling found in most hardware stores, a 3/8" NPT/ hose barb fitting, and 2 steel hose clamps (4 if using a universal K&N). 1) Disconnect the battery. Loosen the hose clamp at the throttle body. 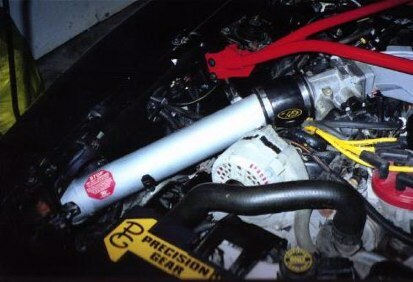 2) Pull off the vent hose which runs from the rubber intake hose to the oil filler neck on the valve cover. Unclip the ACT sensor using a small slot screwdriver. Remove the sensor at this time from the rubber hose. 3) Unclip the clamps which hold the air box together and remove this section. 4) With the first part out of the way, unscrew the bolt which holds the remaining section of the air box to the fender. Remove the air box along with the filter. 5) Pull apart the plastic housing which has the stock MAF (Mass Air Flow sensor) inside. Remove the MAF keeping the wiring harness intact and discard everything else including the wire screen. 1) Start off by cutting an 18-20 inch piece of PVC pipe. You will test fit the assembly once everything is ready so that you can find the best position for the ventilation tube and the ACT (Air Charge Temp. sensor) how everything will fit together. 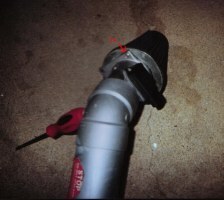 2) Place the 45* PVC elbow on one end of the pipe. Be sure not to glue anything yet! 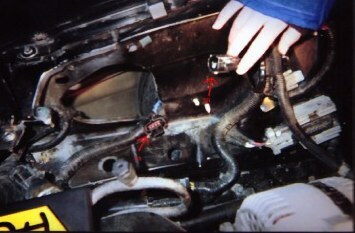 3) Remove the pipe from the engine compartment. Drill a hole just large enough for both the brass fitting and ACT sensor that you have marked on the pipe so that the hole is slightly smaller than these pieces. I used a 1/2 inch drill bit to start and kept wearing away the sides until the sensor and brass fitting fit. You have to be careful as you thread them into the pipe so that you don not strip the threads you are making. 4) File or grind down the small hump on the MAF sensor (not the flange side) so that it will fit snug into the 45* PVC elbow. Don't put it in yet! Orientate the MAF as I have in my pictures or place the pipe back into the engine bay and test fit the MAF sensor within the fender on your own. Now jamb the MAF into the 45* PVC elbow the exact way that you want it. While it is removed from the car again. 5) If using your stock replacement K&N filter as I have, you will have to do a little work to it. You will need to grind off the ring which extends out from the base of the filter. I accomplished this with my electric grinder. I just ground off the ring until you see what I have in the pictures. With the ring still intact, you cannot slide the pipe assembly into the fender. 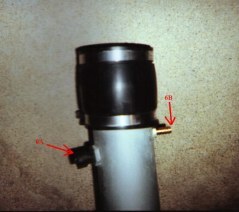 sensor and mark where the flange holes line up on the filter. Pre-drill these holes with a very small drill bit so that it will be easier to start the self-tapping screws into the metal of the filter. I would recommend installing the screws once into the filter so that they are fully tapped when you install the filter to the flange. 7) If you are going to paint your pipe, now is the time to do it. Remove the rubber coupling. I left the sensor, brass fitting, and MAF in place and masked them off. Also, I packed old newspaper into the openings of the pipe to prevent fouling of the MAF and ACT. You must sand the pipe and prime if you want the paint to last. Since I knew I would be replacing this pipe with a year I sanded with 120 grit paper, primed (two coats) with gray automotive primer, and applied two coats of metallic silver spray paint. 1) After the pipe has been given enough time to dry and the masking removed, place the rubber coupling back onto the pipe and screw on the filter. 2) Observe the picture to the right. Reroute your MAF wiring harness to look like this. 3) Place the pipe into place and connect the ACT sensor, vent hose and the MAF sensor. You will have to go underneath the car to hook up the MAF inside the fender. Don't forget the hose clamps as well! 4) Connect the battery and let the car idle for 5 minutes. The computer must now calibrate itself to the new pipe. After the five minutes is up take it out for a spin. Let me know what you think!